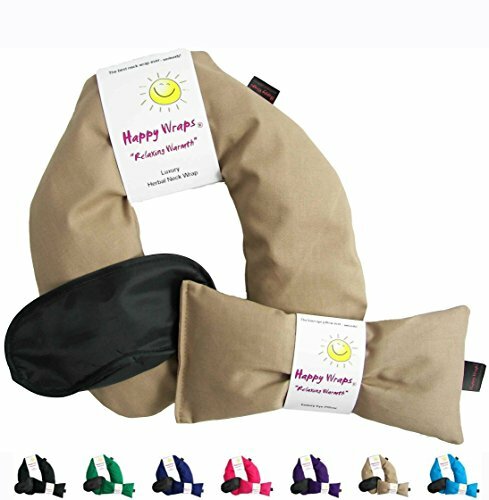 Happy Wraps® are the softest, most relaxing microwave herbal neck wraps, herbal packs and eye pillows on the market, guaranteed! The Happy Wraps® Neck Wrap provides the ultimate in pain and stress relief. Soothing warmth melts away pain, tension and stiffness from neck, back and shoulder areas leaving your body relaxed, renewed and refreshed. The Happy Wraps® Neck Wrap is filled with unscented flax seed. For Hot Therapy - Microwave it. - For Cold Therapy - Freeze it. Stays in place while walking, sitting at your desk or standing or relaxing around the house. Every day is like a day at the spa. Enjoy our gifts to you a Free Happy Wraps® Flax Seed filled Eye Pillow, use cold to relieve migraines, stress, puffy eyes, perfect to block out light for peace and tranquility, plus a Happy Wraps® Lights Out Sleep Mask for the perfect nights sleep.Our gifts to you provide a total relaxation experience. Always trust the Happy Wraps® Brand "Save money, Live well" Backed by our 30 day money back guarantee. 100% Made in the USA. All images and descriptions are the sole property of Happy Wraps® and may not be copied or duplicated without written documentation.Violators will be will be held liable for copyright and trademark infringement. Designer Luxury 100% Cotton Microwavable Unscented Flax Seed Neck Wrap. "Nobody ever said feeling good had to be boring!" Includes Free matching Unscented Flax Seed Eye Pillow and our Lights Out Sleep Mask for the perfect night's sleep. Our Gifts to You. Simply put......Our Neck Wraps Work! Perfect for Stress Relief, Neck Pain, Arthritis & Migraines. Hot, Cold Therapy all in one. Relax in the soothing warmth of a cozy unscented neck wrap. The ultimate in pain and stress relief. Soothing warmth simply melts away pain, tension and stiffness from neck, back and shoulder areas leaving your body refreshed, relaxed and renewed. View More In Migraine Relief. If you have any questions about this product by Happy Wraps®, contact us by completing and submitting the form below. If you are looking for a specif part number, please include it with your message.